I was already a big fan of drinkable yogurt when I was asked if I would like some samples of Lifeway kefir. Kefir is also a drinkable, fermented dairy product, and I was happy to get to taste several different flavors. In addition to the health benefits of the calcium and live and active cultures in kefir, it also lasts a nice long time in the refrigerator. The samples I received arrived at the end of January, and the expiration dates on them are in mid-April. I immediately popped open the strawberry kefir to have a taste, and it was well-flavored, not too sweet, and pleasantly thick while very drinkable. Kurt and I could have happily and easily just enjoyed all of those samples as beverages, but I decided I needed to get a little creative. I thought a frozen yogurt kind of concoction would be a good direction to take, and I set about finding some sources for inspiration. First, I looked at the blueberry frozen yogurt in The Perfect Scoop , and then I found Clotilde’s recipe for lemon kefir ice cream. In The Perfect Scoop, the blueberry frozen yogurt is made with lots frozen blueberries. I started with that idea. I pureed three cups of frozen blueberries with some blueberry flavored kefir in the blender. In the book, since plain yogurt was used, additional sugar was added to the ingredients to be blended, but since my flavored kefir was already sweetened, I skipped the sugar. 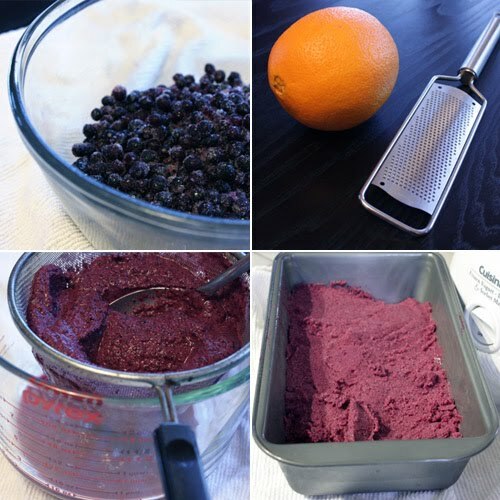 That puree was then pushed through a strainer to remove the blueberry seeds and skins, and the result was a very smooth, purpley, and tasty puree. In Clotilde’s recipe, lemon zest and limoncello were added to the mix before the ice cream was churned. My limoncello still wasn’t ready, so I added some orange liqueur and orange zest instead. Then, the finished mix went into the ice cream maker for 35 minutes. It wasn’t as icy as a sorbet, but the frozen fruit content took it in that direction. The texture actually fell somewhere in between sorbet and ice cream, and the subtle bit of orange offset the blueberry flavor well. 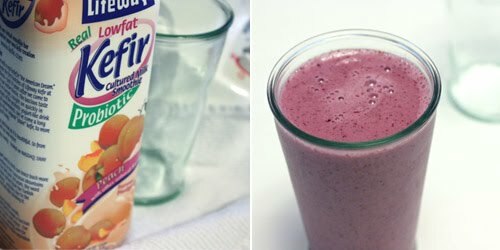 To take it one step further, I also used the blueberry kefir ice cream in a shake blended with some peach kefir since I’ve been a fan of that combo since I first had blueberry-peach pancakes many years ago at Kerbey Lane Cafe. That was a glass full of frozen, fruity goodness. It was fun to mix and match the flavors and make frozen treats, but the remaining samples will be great instant breakfasts too. Interesting! I love the flavors - I can imagine the tangy-ness to be perfect! Nice and I keep seeing Kefir, I should try it. Interesting. I've never heard of Kefir as much before. I want to try it now. I love the color of the ice cream. This would go great for dessert right about now. I don't care if it's cold out. I was ice cream!! Kefir? Is it like yogurt? Sounds good and healthy at the same time. pigpig: Yes, a lot like yogurt. The bottles of kefir from Lifeway were very much like drinkable yogurt smoothies. Mmmhhh, I'm drooling... That ice cream looks sooooo good! 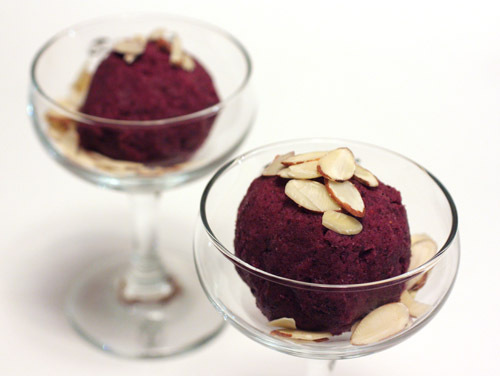 How cool - I love the idea of blueberry ice cream made with Kefir, excellent! That color... is just amazing. Sounds like an interesting icecream flavor! my husband loves kefir. I'm going to have to give this a try! Very lovely! Such great color & very nice photo. Love kefir. I can drink unflavored kefir like I drink milk. So delicious, versatile, and good for you. Thanks for showing us another way to use this awesome stuff. I love this ice cream. I also made Clotilde's lemon kefir ice cream & loved it so I will certainly love this version!! The color of that is just astounding. It looks like there must be red wine in it, but there's not. Amazing! That's a great idea to make kefir icecream matched with blueberries. Beautiful colour and mouthwatering. I love every things probiotic. Your blueberry ice cream must taste divine. 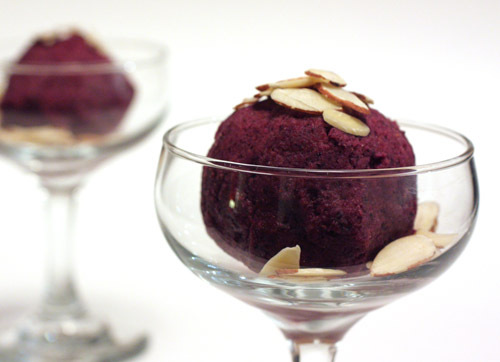 Wow, this Blueberry Kefir Ice Cream sounds refreshing and delicious! Have you ever considered making your own kefir at home?! It is very beneficial for your health and is so easy to make! All you need are kefir grains (probiotic cultures) and milk. I am selling kefir grains in my etsy shop for only $5.75 and this can produce yummy, healthy kefir indefinitely! I obtained these exceptional kefir grains from the Pockets of the Future family from the beautiful mountains of southwest Virginia; and their grains came from Dominic Anfiteatro the kefir guru from Austrailia. Here are the links to their very informative websites about kefir! What a gorgeous ice cream! The tang of the Kefir with the blueberries sounds delicious. Love keifer, and just made my own recently. If it weren't a bit on the nippy side, I'd say your ice cream would be the perfect treat today. It look very delicious, can I change kefir with yogurt? dhan: Yes, you can use yogurt instead of kefir. That will be delicious too! does freezing the kefir kill the probiotics like cooking does? I have only been making my own kefir for a shot while, using raw organic milk. Loving the smoothies and dressings, but would love to branch out as we are now getting sooo much kefir. On the Lifeway site, they state that freezing does kill off the probiotics. It puts them in a dormant state until they're rewarmed when eaten.